Francesca Tarocco teaches Chinese religions and contemporary Chinese visual culture at NYU in Shanghai. She was educated at Venice University and at the School of Oriental and African Studies in London (SOAS). Between 2005 and 2008 she was the recipient of a Leverhulme Trust Fellowship Research Grant for the project “Printing and Praying: The Buddhist Press in Modern China”. Running through her research and art-related projects is a concern with the roles of Buddhism in the making of Chinese (and global) modernities and with the religious dimensions of contemporary sinophone cultures. She is the author of The Cultural Practices of Modern Chinese Buddhism: Attuning the Dharma (Routledge, 2008) and has co-authored three other books: Karaoke: The Global Phenomenon (Chicago University Press, 2007), Made in China (Mondadori, 2008), and Liu Bolin: Hide and Seek (Ultracontemporary, 2008). Her recent articles include: “Paper Metaphors, On Yan Changjiang’s Photographs” in Fantom Photography Quarterly, 2011, “Terminology and Religious Identity: Buddhism and the Genealogy of the Term Zongjiao”, in Dynamics in The History of Religions (Brill, 2011), “On the Market: Consumption and Material Culture in Modern Chinese Buddhism” (Religion, 2011) and “Pluralism and its Discontents: Buddhism and Proselytising in Modern China” (Oxford University Press, 2013). Her current book project is entitled The Re-enchantment of Chinese Modernity: Photography, Buddhism and History. Anna Greenspan teaches philosophy and urbanism at NYU Shanghai. She earned her Ph.D. in 2000 from the philosophy department at the University of Warwick (UK). Her thesis concentrated on the connections between transcendental thought and innovations in the technologies of time. Whilst at Warwick, Anna worked intensively as a member of the Cybernetic Culture Research Unit (ccru). In 2001 Anna was granted a SSHRC postdoctoral fellowship in conjunction with the program in humanities computing at McMaster University (Canada). Her research on globalization and the digital periphery focused on India’s emerging cyberculture. This resulted in a book entitled India and the IT Revolution: Networks of Globalization that was published by Palgrave in 2004. Anna first moved to Shanghai in 2002. Since then she has worked as a writer and teacher focusing increasingly on the contemporary rise of the metropolis. From 2007-2009 Anna worked as a key contributor and associate editor to Urbanatomy - an in depth profile and guide to the city. Her book Shanghai Future: Modernity Remade will be published in December 2013. In 2009-2010 Anna organized a series of lectures with Shanghai’s Urban Research Lab, which functioned as one of the precursors to the Shanghai Studies Society. Shaoyi Sun is Research Professor of Film and Media Studies at Shanghai University’s School of Film & TV, Adjunct Professor at NYU Shanghai, Board Member of NETPAC International (Network for the Promotion of Asian Cinema), and Vice President of the Council of China’s Digital Film & Program Union. His research areas include Film Theory, New Media Studies, Comparative Studies of Chinese and American Cinemas, and Cultural Studies. 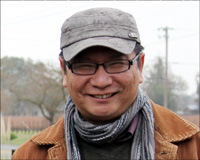 He has taught Chinese film, literature, and cultural studies at USC and UC Irvine. He was the NETPAC juror of the 2009 Singapore International Film Festival (Chair), the 2007 Brisbane International Film Festival, the 2001 Hawaii International Film Festival, and a jury member of the 2011 Bengaluru International Film Festival (India), the 2008 Shanghai International Film Festival’s International Student Shorts Award and the 2000 Dhaka International Film Festival. Sun is the author/editor of The Matrix of Cinema: Cinematic Space and Cultural Globalism (Fudan University Press, 2010), Lights! Camera! Kai Shi! : In-Depth Interviews with China’s New Generation of Movie Directors (EastBridge, 2008), The Imagined City: Literary, Filmic, and Visual Shanghai, 1927-1937 (Fudan University Press, 2009), Structural Transformation of the Media Industry in Asia (co-editor; Shanghai Joint Press, 2009), Global Media Policies: New Perspectives (co-editor; Shanghai Joint Press, 2005) and the Chinese translator of Rey Chow’s Primitive Passions: Visuality, Sexuality, Ethnography and Contemporary Chinese Cinema (Taipei: Yuan-Liou Publishing Co., 2001). He is now working on his second English book featuring some of the leading young Chinese filmmakers who were born after the end of the Cultural Revolution. Sun can be reached at shaoyis@gmail.com.